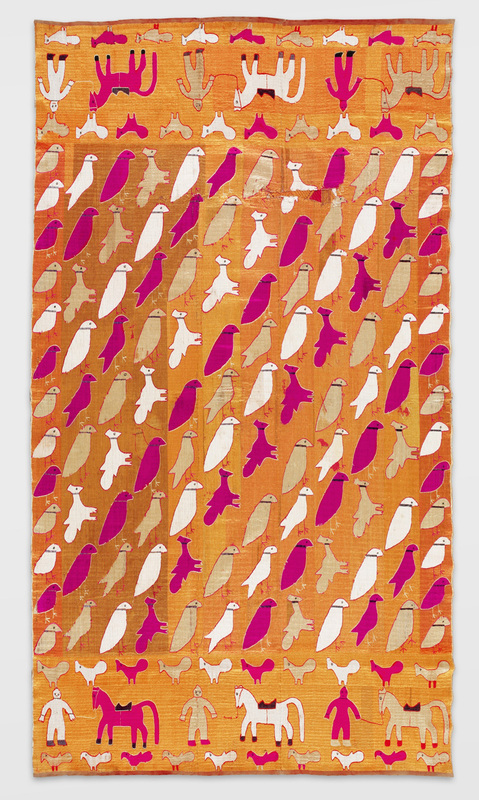 Tota Bagh Phulkari, 20th century. Artist/maker unknown, Punjabi. Handspun cotton plain weave (khaddar) with silk and cotton embroidery in darning, buttonhole, and chain stitches, 7 feet 8 3/4 inches × 56 inches (235.6 × 142.2 cm). The Jill and Sheldon Bonovitz Phulkari Collection. Phulkari, meaning “flower work” (phul = flower, kari = work), is an embroidery originally made throughout Punjab, a region now straddling Pakistan and India. 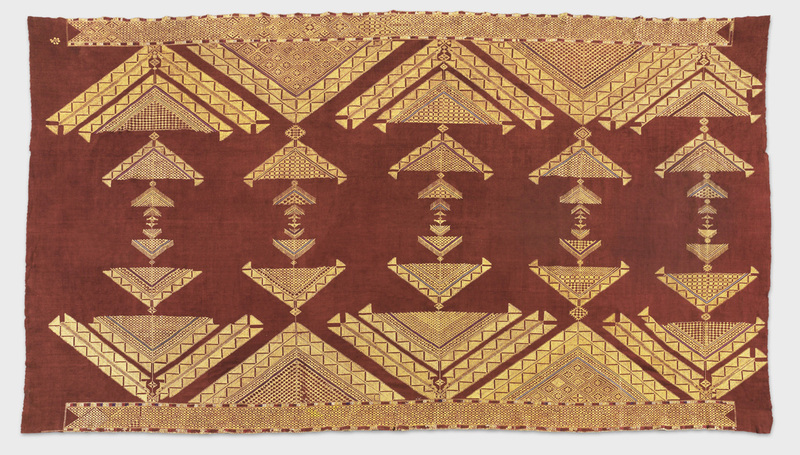 Traditionally, the base cloth was locally handspun and handwoven cotton called khaddar. The thread, called pat, was unplied silk usually imported from China. The dominant embroidery stitch is the darning stitch (a straight stitch in parallel rows), although artists interspersed it with other stitches. Perhaps because of thread’s high cost, most pieces show embroidery only on one side of the cloth. Phulkaris were a crucial part of a Punjabi woman’s material wealth. Young girls learned needlework from their older female relatives and friends. Often they made phulkaris for their own dowries, which they brought with them to their husbands’ home when they married. 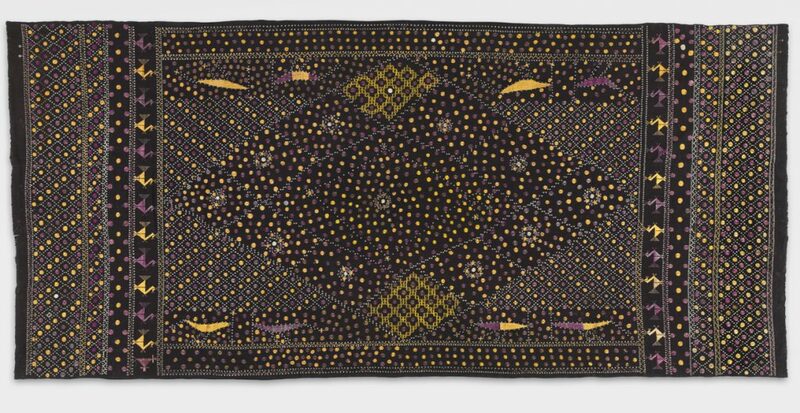 Primarily intended as large shawls worn draped over the head, phulkaris could also function as bedding or wall hangings for special functions. While each phulkari is unique, they may be grouped into types by designs and background colors with names such as thirma (white), sainchi (figurative), or bagh (garden). 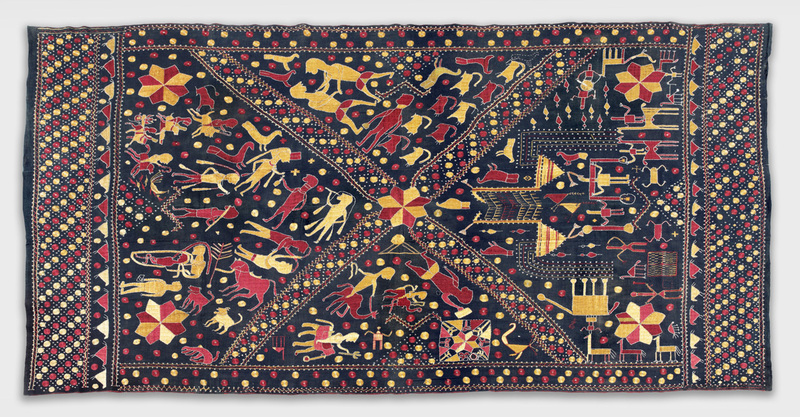 Highlighted here are nineteen superb phulkaris from the Bonovitz Collection, promised gifts to the Philadelphia Museum of Art. All were probably created before the Partition of Pakistan and India in 1947. Also included is a small selection of traditional phulkaris from the Museum’s permanent collection. The exhibition concludes with a creative twenty-first century reinvention of phulkari in the high fashion garments of Manish Malhotra, one of India’s leading designers. This exhibition is made possible by Jill and Sheldon Bonovitz, The Coby Foundation, Ltd., and The Stella Kramrisch Indian and Himalayan Art Fund. 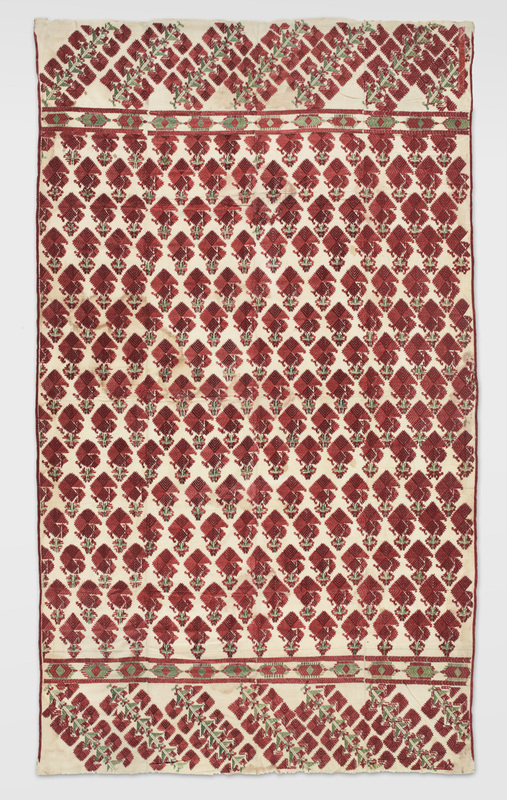 Bagh Phulkari, 20th century. Artist/maker unknown, Punjabi. 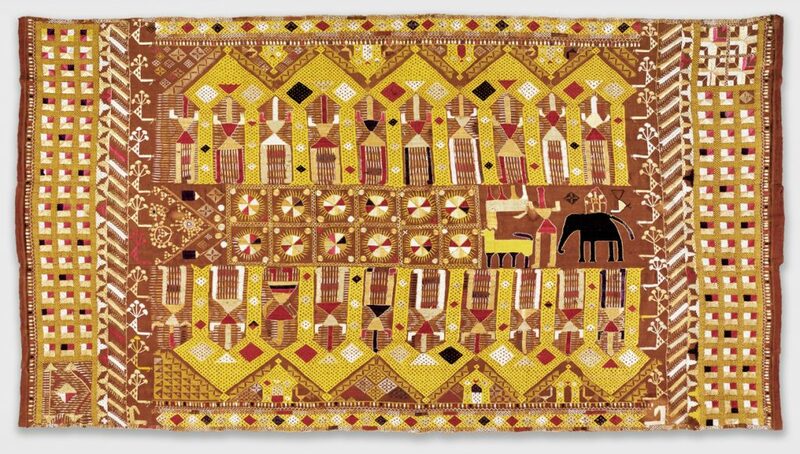 Handspun cotton plain weave (khaddar) with silk embroidery in darning, pattern darning, running, chain and cross stitches, 8 feet 3 3/4 inches × 59 1/2 inches (253.4 × 151.1 cm). 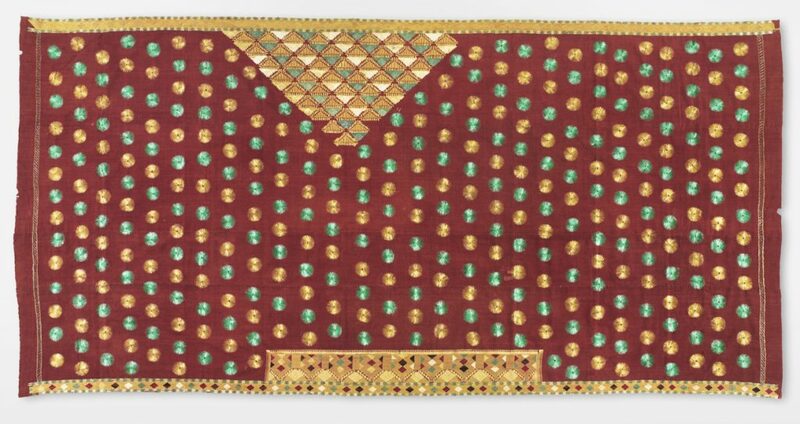 The Jill and Sheldon Bonovitz Phulkari Collection. Thirma Phulkari, 19th century. Artist/maker unknown, Punjabi. 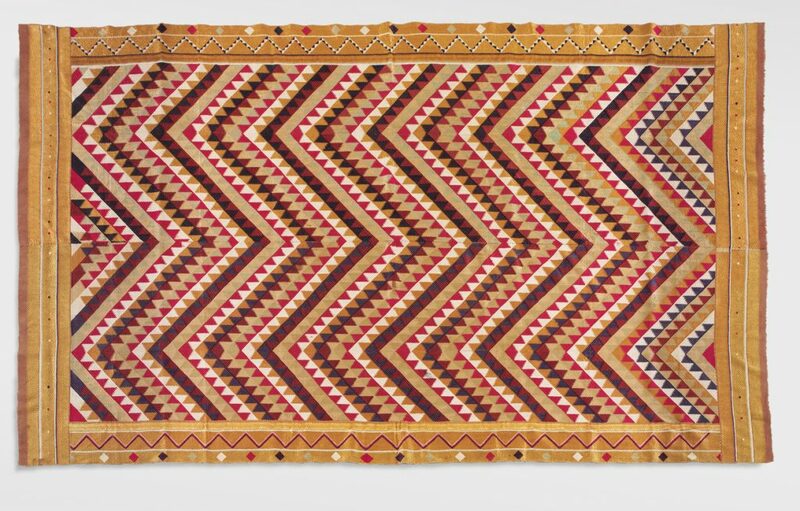 Handspun, handwoven cotton plain weave (khaddar) with silk embroidery in darning, whip, and running stitches, 8 feet 5 inches × 58 inches (256.5 × 147.3 cm). The Jill and Sheldon Bonovitz Phulkari Collection. When India gained independence from Great Britain in 1947, Punjab was divided—its western part in Pakistan and its eastern in India. The devastating results of Partition left many millions dead, injured, and displaced. Most families lost their heirloom phulkaris and few women had the time or facilities to embroider, apart from occasional commercial work. Over the past sixty years, Punjabis of all religions—Muslims, Hindus, Christians, and Sikhs (a faith whose holy sites are located in Punjab)—have emigrated throughout South Asia and around the world. Today they are the largest South Asian diaspora. Phulkari embroidery has retained enormous emotional and symbolic significance for all Punjabis and it has been reenvisioned in many ways. from the Jill and Sheldon Bonovitz Collection, Punjab, The Coby Foundation, The Stella Kramrisch Indian and Himalayan Art Fund on March 26, 2017 by admin1.